Use this tab to select which alerts should be triggered for this monitor. Normally, ProtoMon will generate a single notification on monitor failure and then a single notification on monitor recovery. If you wish to receive the additional notifications (that monitor still remains failed), you can enable the Repeat the alerts option and select a desired repeat interval. 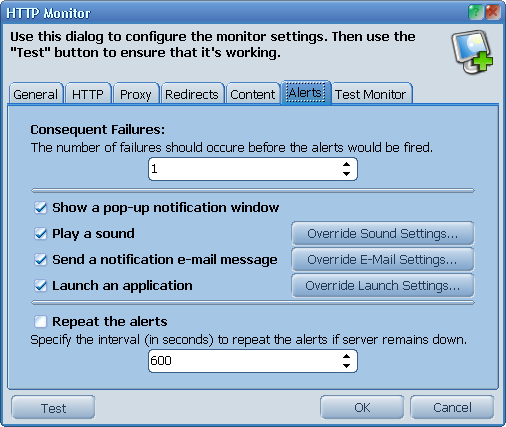 The Consequent Failures option allows you to trigger the alerts only after the specified number of failed checks. This can be useful if you wish to have more detailed statistics (check monitor more frequently), but don't want to get the alerts on short-time failures.